I’ve been pretty absent from the blog for a while for a combination of reasons. Some of these were simply practical. We’ve just finished a building project in our house, it’s great but has meant every single room was in chaos. Combine sorting that out with two kids, a job and needing to go to bed at 8pm every night as I’m so tired and nothing much else has got a look in. I think there may be another reason though, if I’m honest I’ve been a little in denial about this whole baby thing. Now I’ve passed the 37 week mark I should probably try to get over that. When we started trying for number three, I’d expected to get pregnant very quickly as I had done with both MissE and MissM. But the months dragged on and I was beginning to resign myself to it not happening. Then, almost a year ago I found out I was finally pregnant only to have that excitement crushed by a miscarriage that dragged on for weeks. When I got those two little lines again, only six weeks after the previous pregnancy was finally, surgically, ended. I didn’t dare celebrate. This time an early scan shouted out good news. The little flicker of a forming heart appearing on the screen as soon as the ultrasound wand was placed on my belly. No searching around in a black void, no uncomfortable internal ultrasound. 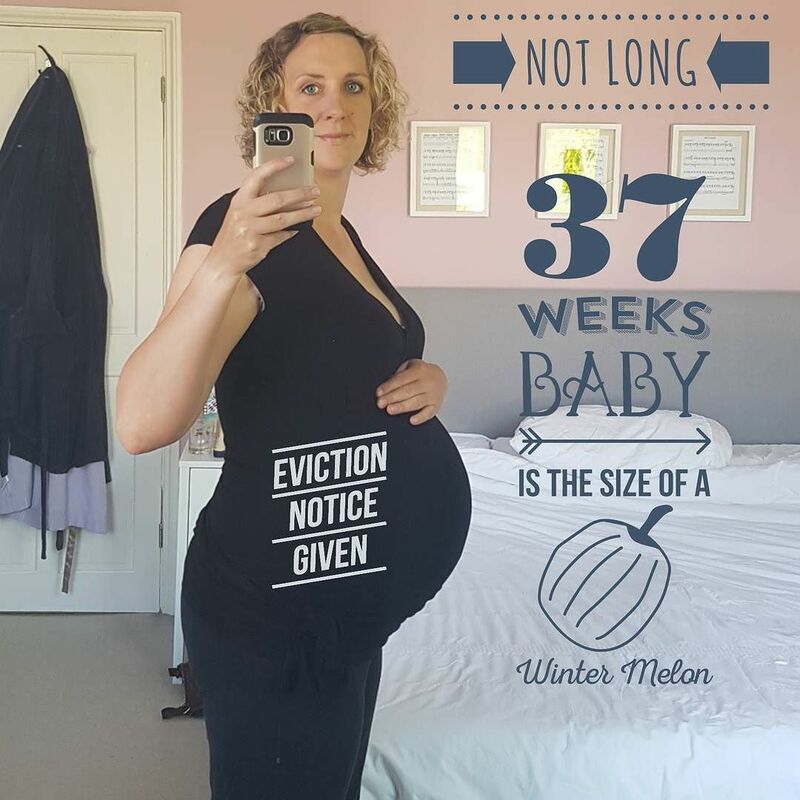 The twelve week scan showed everything to be just as it should be too but, unlike my first two pregnancies, I didn’t feel like putting up a facebook post or writing about it all on here. It still felt too fragile, too risky. We told close family and, because I work in a biohazard lab, my manager and health and safety team. But I held off spreading the news more widely until after the 20 week scan, by which point people would probably have guessed from looking at me anyway. As far as my poor abdominals are concerned, resistance is now futile. Even now, I’m finding it hard to believe that I am full term pregnant, everything is going well and the C section is booked in less than two weeks from today. I’ve been pregnant for most of the last year, with two almost back to back first trimesters. Being pregnant is now my normal state, So it’s strange that it will be ending so definitely and so soon. But of course it will and today is the first time I have sat down with a cup of tea, no kids, no work and no massive to do list. I’m finding it hard to take on all the advice to relax but I probably should. It just took me almost forty minutes to walk a little over a mile and I’m waking up several times each night with the all too familiar hip pain I remember from before MissE and MissM were born. I should probably be making a concerted effort to get over that denial. But then, although it has taken a long time to get this far, It’s been even longer since I had an actual newborn to care for. MissM is almost four and half. Somewhere in the depths of my patchy memory I seem to think it’s quite hard work, but maybe I’m just misremembering that. I’ve done it all twice before. This baby is going to sleep and feed perfectly. So it’ll be easy this time right?